On the 13th (Sat), meet the residents at Cheyenne Mountain Zoo, then tour the pleasant surroundings at Garden of the Gods, and then expand your understanding of the military at United States Air Force Academy. For maps, ratings, where to stay, and more tourist information, go to the Colorado Springs sightseeing app . Kansas City to Colorado Springs is an approximately 5.5-hour flight. You can also do a combination of flight and shuttle; or drive. The time zone changes from Central Standard Time to Mountain Standard Time, which is usually a -1 hour difference. Prepare for little chillier weather when traveling from Kansas City in April: high temperatures in Colorado Springs hover around 60°F and lows are around 33°F. Finish your sightseeing early on the 14th (Sun) to allow enough time to travel to Teec Nos Pos. Teec Nos Pos is a census-designated place (CDP) in Apache County, Arizona, United States. You've now added Four Corners Monument to your itinerary. Start off your visit on the 14th (Sun): appreciate the history behind Four Corners Monument. To see maps, photos, where to stay, and other tourist information, use the Teec Nos Pos travel route planner. Traveling by car from Colorado Springs to Teec Nos Pos takes 7.5 hours. Alternatively, you can fly. Expect a daytime high around 65°F in April, and nighttime lows around 29°F. On the 14th (Sun), you'll have the morning to explore before heading off to Grand Canyon National Park. On the 15th (Mon), trek along Bright Angel Trail. To find photos, reviews, and more tourist information, read Grand Canyon National Park day trip site . You can drive from Teec Nos Pos to Grand Canyon National Park in 4 hours. 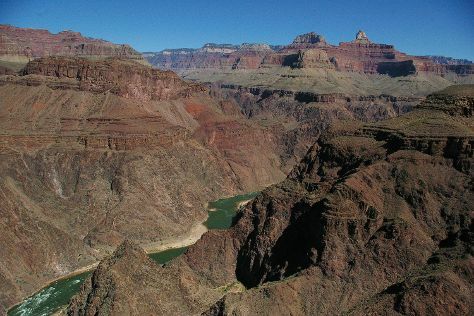 In April, daily temperatures in Grand Canyon National Park can reach 62°F, while at night they dip to 26°F. Wrap up your sightseeing on the 16th (Tue) early enough to drive to Santa Barbara. On the 17th (Wed), you'll have a packed day of sightseeing: take in panoramic vistas at Santa Barbara County Courthouse, then steep yourself in history at Old Mission Santa Barbara, then meet the residents at Santa Barbara Zoo, and finally take a leisurely stroll along Stearns Wharf. To see more things to do, other places to visit, where to stay, and more tourist information, read Santa Barbara travel route planning tool . You can drive from Grand Canyon National Park to Santa Barbara in 9 hours. The time zone difference moving from Mountain Standard Time (MST) to Pacific Standard Time (PST) is minus 1 hour. When traveling from Grand Canyon National Park in April, plan for somewhat warmer days and much hotter nights in Santa Barbara: temperatures range from 71°F by day to 50°F at night. Finish your sightseeing early on the 18th (Thu) to allow enough time to drive to Solvang. Solvang is a city in Santa Barbara County, California. On the 18th (Thu), take in the history at Old Mission Santa Ines, indulge your senses at some of the top wineries in the area, then admire the architecture and history at La Purisima State Historical Park, and finally tour the pleasant surroundings at Hans Christian Andersen Park. For maps, where to stay, other places to visit, and more tourist information, you can read our Solvang online visit planner . Traveling by car from Santa Barbara to Solvang takes an hour. Alternatively, you can take a bus. Plan for little chillier nights when traveling from Santa Barbara in April since evenings lows in Solvang dip to 44°F. You will leave for home on the 19th (Fri).